With a Quer-durchs-Land Ticket in the pocket and a good book to fill the three hours of travel with the regional train, we arrived in Rostock. The journey went smoothly, with a nice employee of the Deutsche Bahn that helped us to catch our connection in time and some noisy ladies that had their glass of champagne at 11 o'clock in the morning and felt the need to generously share different experiences about washing jackets with the rest of the world. Out of the window we saw the traces of the recent floods, but also lavender and poppy fields. On our way back, we discovered a depressing side of the landscape, with many empty and half-destroyed houses during the first 15 minutes of the train trip. Hundreds of teenagers were heading to a festival in Strelitz and at least of a couple of stations we were able to observe the 'new generations' smoking and drinking beer and laying on the floors, despite of the big number of free 'normal' seats. 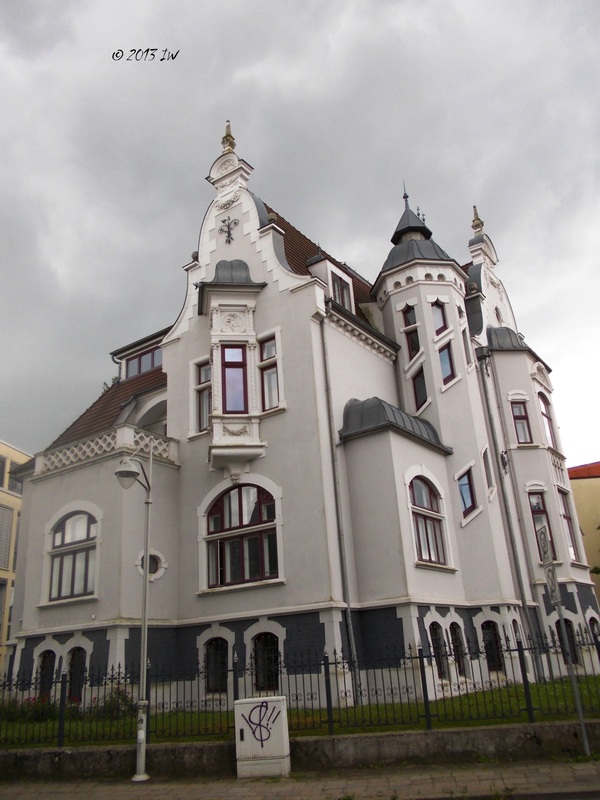 One of the most unexpected things about Rostock is the eclectic architecture: a combination between Art-Deco/Baroque and some classic touches. The buildings from the old city are unique, newly built and looking clean and elegant. Even the Mc Donald's is hosted in a building with rubenesques small statues at the entrance. In the former communist corner the classical and ugly block houses were also repainted and got a new make-up that gives them a better and younger look. Another visual catch of the city is the big number of statues and fountains - sometimes in togetherness - that gives to the city a certain artsy touch. We did not find too many galleries or art museums or exhibitions though. 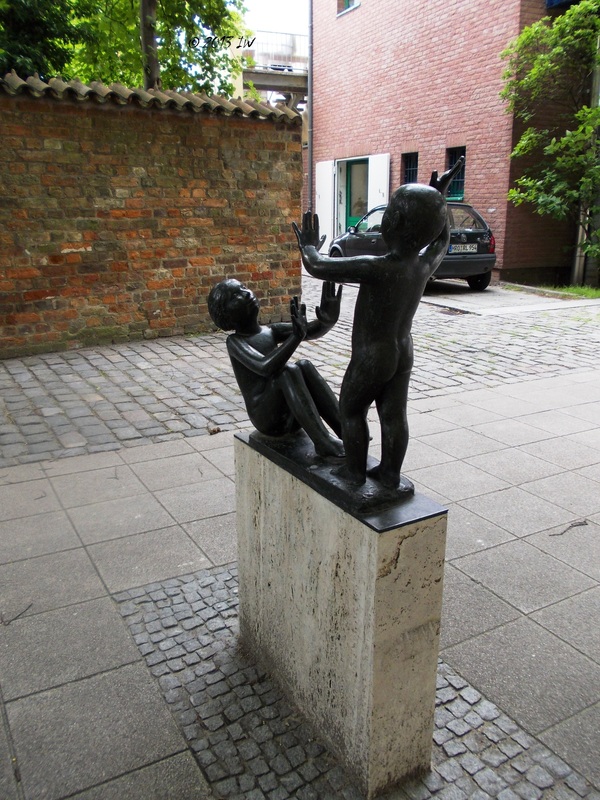 As an old Hansa town, Rostock has a museum dedicated to the local history of shipping, but also the oldest university from the Baltic area, serving students from 1419. We arrived during the vacation, but the young ambiance was overall present all over the streets. We also noticed the big number of families with one or more children, hence the big parks situated in different parts of the town. There it is also a dark history of the city during communism, as here was situated one of the regional centers of the secret police - Stasi - that can be visited nowadays for free. As I already saw a couple of Stasi exhibitions and places in Berlin, I decided that I rather skip this one. Challenged by what we saw and did not expect after serious documentation, we booked a tour of 50 minutes at the Tourist Information Center - 10 Euro/adult, that can be paid by card. The minibus with 8 seats operates every hour from 10am to 5pm and with the danger of a serious rain ahead, we thought that it is the best way to do something interesting and learn more about the city. Unfortunately, the guide was extremely unprofessional, asking a lot of personal questions and focusing on his failed marriages instead of giving us the decent amount of information in exchange of our hard-worked 10 Euro. Trying to change our mood after the bad investment, we did some window shopping for one hour. At the shopping centers or in the shops in the old town, the sales season just began and we hardly resisted the temptation to get something back to Berlin. If not in the mood for shopping, there are plenty of restaurants and cafes, many in the port area, but with higher prices, especially for the local fish meals. After the tour ended, we returned to the port and had a small walk for 30 minutes. It was a quiet afternoon, without too many people around, but with many boats swinging in the rhythm of the wind. It was still sun, but the army of black clouds was gathering, but we were not still sure that we want to take the first train back home. The connection to Berlin - direct or with one change, with the Regional Express - takes place every two hours, but missing suddenly the sea, we decided that we should go further, to Warnemünde, at least for a couple of hours. Why not, actually? Our tickets allowed the transportation with the local S-Bahn without additional costs and the beach of the Baltic Sea was only 15 minutes away. 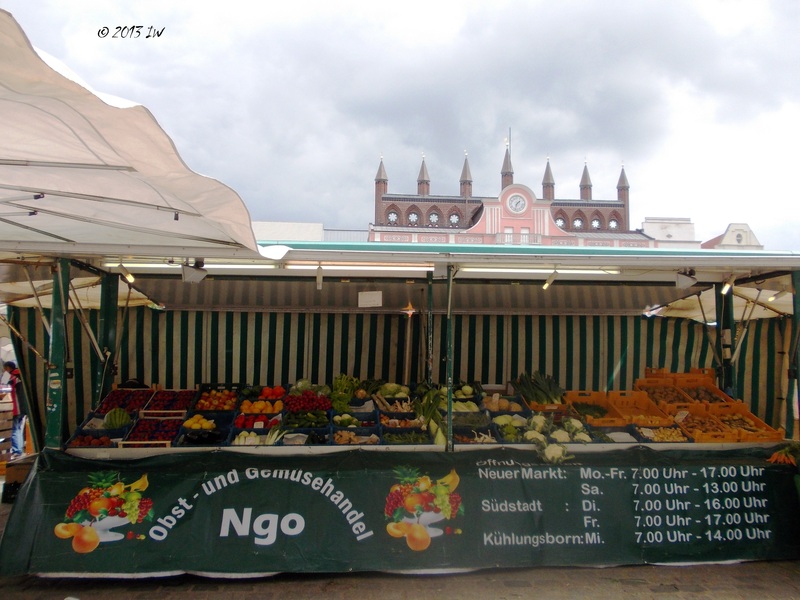 In the old market - Alter Markt - you can buy fresh fruits and vegetables. There is also situated the Rathaus. Besides the architecture, we were surprised by the statues situated in the most unexpected corners of the open markets or streets.